You will agree with me that a swimming pool makes summer an easy time despite the hot weather. But what if you don’t have a swimming pool on your property? What if the high costs of building one is a headache for you? What if you don’t have enough space to build a full-size pool? And the construction time too; are you patient enough? If any of this is a bother for you, then it’s time you invest in an above-ground pool. It is cheaper, portable and takes a few hours only to install it. But then, shopping for the best pools is the real hassle for many homeowners and that’s why we decided to review some of the best products on the market that will guarantee you value for money. So, without further ado, here are our top 5 picks for the best budget aboveground pools that should top your wish list this summer. 6.1 What is an above-ground pool? 6.4 How much do above-ground pools cost? 6.5 How many years do above-ground pools last? 6.7 Steel or aluminum wall? 8.1 1. What brand are you buying? 8.2 2. Is space enough? 8.3 3. What is the size of your family? I know small kids can get stubborn especially when they want the fun of swimming in family pools which is a great risk. But here’s a great kids above-ground pool that will give your loved ones a great time in the water without running bigger drowning risks. It is very durable and despite that fact that the kids will overgrow it fast, it will have a lot of other uses at home. 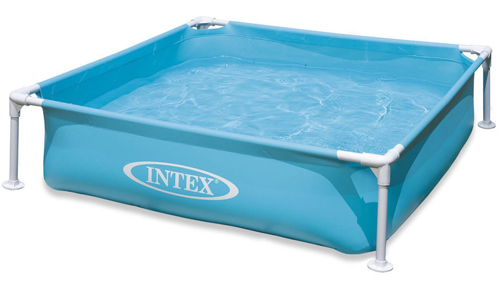 Measuring 48 x 48 x 12 inches, Intex 57173EP is a small frame pool built for small kids and can hold up to 89 gallons. You understand that allowing very small kids to swim in large pools is a serious risk. But then, you still want them to enjoy the waters during summer so this model will be best for you. It retails at only $33 so you don’t have to think of it as such a big loss once your kids outgrow it. Apart from kids, this pool can also come in handy when you have pets; remember they love water too. The size is perfect for small dogs and cats to cool down during summer without risk of drowning. Unfortunately, the pool material is not very tough. My son used it for 3 months or so and it permanently became the dog’s pool. Right now it has a lot of scratches and paw marks. But then, this is expected considering it is for light duty use. You can also use it as a duck pool if you want a pool that is easy to manage (drain and fill) compared to having in ground duck pools. For those who keep turtles, this is also a great product. Installing is pretty easy and I will guarantee that even with basic joinery knowledge, you will be able to set it up. The secret is knowing what part is for what joint, that’s it. On the downside, the bottom is not as hardy and if placed on an uneven surface, it will get damaged and even lead to leaks. That said, it is important that you make sure the surface is smooth, with no hard objects. The bottom and walls are made from heavy vinyl and though it may not be as tough, at least it comes with a repair kit just in case. If you have kids aged 3+, this is the best pool to get them as it has little drowning risk compared to adult pools. It is cheap, easy to install and has a range of uses besides serving as a kids’ pool. Round pools are the best compared to oval pools and the Intex 28253EH happens to be the best round pool. It is large enough to fit several adults and comes with a filter pump so you only need to set it up and voila, you can have a swim in an hour or so. The Intex 28253EH is a family size pool and will comfortably hold 6-7 average sized adults. It boasts a round shape with a diameter of 18 ft. and a depth of 42 inches. This is enough for a good hot afternoon relaxing in the water. What I like most about Intex pools is the easy installation. As long as you know what every part is for, it should take you just 60 minutes and you will be ready to fill it with water. That takes us to our next topic; capacity. This pool can hold up to 6, 423 gallons when at 90% full. This is courtesy of the strong and sturdy vinyl walls that can withstand the pressure. Even though it is quite expensive, I still find it value for money considering round pools are cheaper in terms of dollar per gallon. I installed this pool 3 years ago at my place and so far so good, it is in top condition. I like the fact that it comes with a ground cloth to shield the bottom and a cover for protecting it against the scorching sun and other harmful conditions. This is something that has made it pass the durability test. The frame is still rigid and this is expected because equal pressure is distributed on the walls. Remember, oval and rectangular pools, especially when not tightly fixed may collapse because pressure is not distributed equally so there is a high chance of stress on some parts. On the downside, this pool has a rather slow pump. Remember, it is a 1500 GPH pump and to fully fill the 6500 gallons capacity is not fast. At least a 2,500 GPH pump would have been a better choice. But then it comes with an efficient cartridge filter which can filter out particles as small as 10 – 15 microns. But then, even though there are two suction outlets, circulation is not very effective because the water pressure is balanced. At least for rectangle pools, the suctions are on one width so naturally, the flow is on the right course. Though it may seem quite expensive, this pool is the best value for money. Retailing at $500, it has a swimming area of 255 sq. ft. so something like the Ultra Frame™ 24ft X 12ft X 52in is quite expensive for 288 sq. ft. If you want more swimming area on a budget, this is your match. If you are on a budget, here is a great Intex pool that we highly recommend; Intex 28317EH. It retails at around $370 and though there are still several other cheaper options, quality puts them off. Remember, when we talk about affordability, we also factor in quality. It would be a bad idea to recommend a pool just because it is cheap – the quality also counts. If you have a small family and you don’t want to spend too much on a pool, then the Intex 28317EH will best suit you. It boasts a rectangular shape and comes with a pump and cartridge filter so you don’t have to incur any other major costs. Installation is very easy and though the manufacturer says that it takes a shorter time, I don’t agree. Yes, it’s smaller so you’d expect fast assembly but then, it has so many vertical supports and each needs more time to fasten. But the good thing is the end result; a strong and sturdy pool with adequate supports on the wall to hold 2,873 gallons comfortably. I wouldn’t say the vinyl walls are that strong but considering this is a light duty pool, I wouldn’t complain much. Also, the vertical supports have some wide feet padding that helps to hold the entire weight of the pool comfortably. Though the build quality is not top notch, I like the ground cover that is laid on the earth before the entire pool is placed on top. It shields the bottom from any damage including corrosion. Like I said, this is a great family pool, and in fact value for money. It boasts a cartridge filter pump that will pump water in very fast while the cartridge filter will capture even the smallest particles that a sand filter would miss. This makes it a very good swimming pool for your family’s health considering the wave of Recreational Water Illnesses (RWIs). It also comes with a debris cover so if you live in areas with a lot of foliage, it will come in very handy. Intex also included a removable ladder which improves safety. For this model, I would say the circulation and filtration system is excellent. Remember, it is a rectangular pool and comes with an easy drain hose that will connect with normal sprinkler hoses. So, when the water gets dirty, you will drain it efficiently by using it to sprinkle your backyard. But the pump is slow and takes quite some time before it’s able to fill the pool. Remember, it is a 1,000 GPH pump so if you want something faster you might want to upgrade. I also like the fact that Intex included their Trademark GFCI technology that shuts off power in the event electricity gets into contact with water. The Intex 28317EH is a great affordable pool if you are on a budget. It can comfortably serve a small family of let’s say 4 and will last fairly well. If you want affordability and good service, forget the cheap models, this is your product! If you want a large pool that will fit all your family needs regardless of the size, the Intex 28361EH is one above-ground pool you should consider. It is large enough to hold 8 people or more depending on their body type. The system comes with a pump and a filter so you can fill it very fast and the water will always be clean. The price too is not bad though you will require a large space to install it. This pool measures 24 ft. by 12 ft. and has a depth of 52 inches. This is enough for an adult to swim and even with a deck, you can also dive. My only problem is the installation and the size of space required to set it up. Also, with the many vertical supports; you will spend over two hours setting it up. But fortunately, filling it is easy and faster. At least Intex included a more powerful pump; a 2,100 GPH pump for this model, but with a sand filter. How I wish it would have a cartridge filter pump to filter out those small particles, as small as 10 – 15 microns. This is in light of the fact that the small particles often lead to bacterial and fungal growth which are leading sources of RWIs. On a positive side though, sand filters require very little maintenance, perhaps a change after 5 years or seven more. I also like the 8,403 gallons capacity which is quite some good amount of water for swimming. I know you must be wondering about the ability of the walls to withstand such weight. I want to mention that these walls are different from the lower models and are reinforced with 3 layers of puncture-resistant material for strength and durability. Though it comes with a ground cover and a debris cover, circulation and filtration are not at its best. The drain valve has very poor suction; it will take quite some time before the entire pool is emptied. But fortunately, you can connect the drain plug to the common garden hose and still use the water wisely for sprinkling instead of wasting it. Retailing at $800, the Intex Ultra Frame™ 24ft X 12ft X 52in is the best option when you want something for the whole family. It is strong and very durable and above all, it will fit over 8 people. If you want something for the whole family, this is the best deal. I know you may want a large pool that will offer a real Olympic sized pool experience and the Intex 28375EH is one pool that will give you value for your money. This model is so massive such that you can also make a deck and get the full experience of an in-ground swimming pool. Installing it will be a little harder and will also take quite some time. The price is also high but considering the size, it is such an excellent product. The Intex Ultra Frame™ 36ft X 16ft X 52in is a very large above pool that actually looks like a ship. It offers a full-size swimming experience including diving but at a cost. First, it requires a large installation ground which may be quite a problem for many homeowners. If your backyard is smaller, try the Intex 28361EH – at least it requires a fraction of what this one needs. Also, the installation time is longer and requires a little professional help – this thing is really massive and you need to get everything right – no guesswork. Now that you are spending a whopping $1,500, I would recommend that you get a professional installer to guarantee a great job. I say this because when you mess just a little bit, the pool would cave in and void the warranty. But this is not to say that if you are a DIY handyman, you should not try to install it – no, you can try, but be sure of what you are doing. The walls are triple-layered just like in the smaller 18 ft. model but this time, more solid and durable frames have been used. Actually, you wouldn’t expect a pool that can hold 14,364 gallons to be frail. But on the downside, this is still a sand filter pump so it’s not best for filtering very small particles though maintenance is less intensive. Regarding the pump performance, I won’t say that it is dismal but for quicker filling, Intex would have included a larger pool pump, say 3,000 GPH +. But then I was contented to know that it has 6 functions; filter, backwash, rinse, recirculate and close system. Among the new features that this pool boasts of is a deluxe cleaning kit that includes a leaf rake, wall brush, vacuum and skimmer net, among others. There’s also a removable ladder with slip-resistant steps that can hold up to 300 lbs. Besides this, there is also a ground cover and as well as a debris cover. Perhaps the icing on the cake is the volleyball kit. Though I am not a fan of volleyball, this pool can be used to play water volleyball. You simply set up the net and voila, you are ready to play – that just shows how big it is! For those who want a large pool without incurring the heavy costs of an in-ground pool, the 36ft X 16ft Intex Frame Set will do the magic. It is big, strong and durable. Though expensive, it is a cheaper option for a full-size pool and is portable too. Now that you know a few of the best above-ground pools in the market, it’s time we have a real conversation about buying above-ground pools. But just before we go deeper, it is important that we have a deep understanding of above-ground pools and what makes them different from in-ground pools. 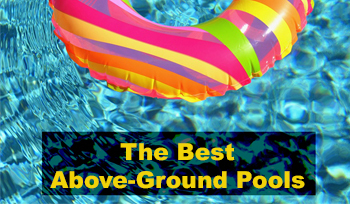 What is an above-ground pool? As the name suggests, above-ground pools are swimming pools that are installed on the ground. To put it into perspective, it is like a basin with water on the floor. To get a deeper understanding of how they work, it is imperative that you understand the different parts of an above-ground pool. The most important parts of an above-ground pool are the wall and frames. Remember, this pool is just like a basin with a solid wall to keep the waters inside. On the other hand, the frame gives the walls the sturdiness required to manage to handle the pressure of the water in the pool. Most pools come with frames made from coated steel, resin or extruded aluminum. There are also uprights, also known as posts that now give the walls extra support. Remember, the aim is to have a solid container that can securely hold large amounts of water. The upright runs right from the bottom plate which is the floor of the pool all the way up to the top rail. These are the major parts but you will also find other accessories like base plates, top caps, boots, and so on. Pools come in different shapes as well as sizes. Though there are no direct relations to performance, shapes are all about personal preference. We have round, oval and rectangular above-ground pools. Get a shape that matches your taste and most importantly, one that best fits the backyard well. Besides shapes, it’s also important to look at the size. There are different size variations of above-ground pools from small kids’ pools to large family sized pools. If you did your homework, you understand that there are different types of pools. The categorization may be on different bases. In this segment, we will try to look at the highlights of each pool to help you make the best choice. As the name suggests, this pool is sunk a little bit into the earth. The walls are made from ¼ inch tongue and groove slats to help withstand the weight of being buried up to the halfway mark. I know you must be asking, what if you sink your ordinary above-ground pool like rolled wall pools? Though it is possible, it requires a lot of operations and a precise mix of slurry between the pool walls and the earth. Eventually, it will be expensive than buying an in-ground pool in the first place. Perhaps the main reason this is a no is that there is a high chance of the pool caving in thus voiding your warranty. Though expensive, these pools are the perfect choice for backyards that slope. Also, if you want a deck too, it is still the best choice too as it will take advantage of the slope so the deck is made with lesser material. In-ground pools are made using thick aluminum which doesn’t scale so you can use chlorine without worrying about calcium scaling. Invented back in the 80s by Aqua Leader, resin pools are increasingly becoming popular. One thing I like about them is that they break the monotony in above-ground pools styles. While you are limited in options when it comes to shapes, resin can be curved to different shapes and also, color can be added, but then, you have to be very careful on the type of resin you choose. We have two types of resin; Synflex resin and low-quality resin. Always look for Synflex resin as it does not crack in cold weather and remains cool to the touch in hot water. If you want to use a saltwater sanitation system, a resin pool will be the best because it doesn’t get affected by salty water. Just like all rolled wall pools, this one is made of one continuous sheet but instead of steel walls like in all rolled wall pools, the wall is made of aluminum. All the other components and accessories are made of aluminum and this makes it a great rust-resistant above-ground pool ideal for use with saltwater sanitation systems too. Regarding prices, they are also quite expensive but then, cheaper than in-ground pools. Installation is also the easiest! These have been around since the invention of above-ground pools. Over the years, steel pools have been improved to bring out the best swimming pool experience. They are very solid and will last for very many years. But then, you have to be keen on the parts especially the uprights and frames. Generally, the larger the parts, the more sturdy the pool will be. If you are worried about users’ safety, some new models come coated with a softer material like dura-tex, plastic, texture-kote, poly-enamel among others and will last up to 20 years. Regarding cost, steel pools are the best when you are on a budget – actually, value for money. This is a combination of resin and steel. Actually, they offer the aesthetics of resin pools and the strength of steel pools. They are priced between steel and resin and offers quite some great advantages so it is a type you should look for if you want a modern pool without compromising on quality. Another advantage of hybrid pools is that they can handle all saltwater sanitation systems and you don’t have to worry about calcium scaling. In the market, you will find different types of pools based on shape. There are round and oval pools and each type has its pros and cons. Here, we are going to compare the two types of pools and see what each offers. Round pools are known to have more structural integrity because the entire weight of the water is distributed equally to the wall edges. This is compared to oval pools that will require ground strapping and even vertical support. Typically, you will find oval pools bowing more than round pools. In terms of installation, round pools are the best choice because they are easy to install, unlike oval pols that have meanders requiring ground strapping and vertical support. They are also easier to clean because there are no dead spots. Perhaps the best thing is that they are cheaper compared to oval pools. On average, the largest round pools are cheaper than most small oval above-ground pools. On the other hand, oval pools are also a bang especially when you have some narrow installation space. Though your backyard may fit a round pool, you may realize you ran out of space when you include the required distances from the fence and house infrastructure like septic tanks. This is when oval pools may come in handy. They are narrow and will still give you the same swimming pool area and leave quite some good spacing for local regulations and well as a sidewalk. But the best thing about these pools is the larger lap swimming area, especially in small backyards. This is a question that is lingering on most people’s minds now that above-ground pools are considered a cheaper option compared to in-ground pools. Here, I wouldn’t say that there is a definite cost but one thing is for sure; they are cheaper than in-ground pools. For starters, you will get an above-ground pool from $10 all the way to $1000 plus. It majorly depends on the size; the larger the pool, the higher the price. While a small baby pool like Intex Kiddie Pool will cost you around $11, a larger family sized model like Intex Ultra would cost you up to $700. Also, factors like brand really affect the price. Popular brands are more expensive than these cheap brands but I can tell you for a fact, cheap is expensive. You would rather spend more on a top brand like Intex, Steel Pro, Bestway, Cornelius Pools, Pool Center, and the rest that gives you value for money both in terms of performance and durability. But that is not to say there are no good cheap brands, yes there are. You can still consider such models when on a budget but make sure you read the reviews of that product beforehand. How many years do above-ground pools last? You will agree with me that one advantage of in-ground pools is the fact that they are more durable; they are constructed, not installed. For this reason, you would want to know about the durability of above-ground pools. The truth of the matter is that while one may think that they are less durable, they can offer years of service just like in-ground pools. But then, maintenance is a big dynamic here as it directly affects durability. If you take good care of your pool, it should last you 5 – 10 years. Also, the materials, frame type, and other structural features play part too but still, maintenance remains the key aspect. That said, you will want to ensure your pool is well maintained. Here are some helpful maintenance tips that will help you keep your above-ground pool in great shape. Just like much other equipment and installation, material is a real concern and that’s why it is a must for us to discuss the materials used to make above-ground pools. You will realize that pools can be categorized depending on the material used to construct it. The most popular categories here are steel, aluminum, resin, fiberglass and hybrid above-ground pools. Each of the materials has advantages and disadvantages. Steel – This is a common material and is liked by many because of its affordability and sturdiness. But unfortunately, steel will corrode and even oxidize pretty much faster especially in salt water and constant sunlight. This is contrary to the fact on book that it is rust-resistant. Resin – This is a great alternative to steel and the main advantage is that it doesn’t get corroded and will not oxidize like steel. So, if you are keen on a durable pool, consider getting a resin pool. Remember, you can get a pool that has been partially or wholly made from resin material. On the downside, it may not offer the same strength as steel but this should not be a major concern. Hybrid – These are pools that blend both steel and resin. Remember, while steel may be very heavy and affordable, you may want something that will last for long even in extreme conditions. That in mind, blending the two gives you a fine product; the perfect blend of durability and strength. These pools are quite expensive and will cost higher than steel or resin pools. Fiberglass – Also known as laminate or composite swimming pool, fiberglass is also another pool material, though less popular. These pools are made using a blend of resin and glass fiber, the result is a strong and aesthetically appealing pool. The price is also affordable but then, these pools are very fragile and need proper care. Aluminum – These pools use high-grade aluminum to make the pool parts; from walls to uprights and even stabilizer among other accessories. The good thing about aluminum is that it is durable like resin and string like steel. Above all, it is lightweight but then, it is also quite expensive but again, worth the money. Perhaps your major concern should be the walls and two materials are popular here; steel and aluminum. But which of the best between them? That’s what we are going to discuss now. For an above-ground pool, I wouldn’t recommend aluminum because it is not strong enough to hold waters and keep the structure firm. Yes, it is lightweight but strength is fundamental if you want a pool with a long lifespan. Fortunately, we now have extruded aluminum which is stronger without compromising weight. For semi-inground pools, also avoid regular aluminum as its weight may make the pool cave in. For pool walls, I would prefer steel anytime because of its strength. But then, from the fact that steel is not resistant free raise a lot of questions. But for a careful pool owner, this should not be a major problem. Remember, maintenance is key when it comes to durability. Above-ground and in-ground pools are the two main types of swimming pool categories. Each of them has salient features that make them different in functionality. Besides, each has its advantages and disadvantages and that’s what we are going to focus on in this segment. A swimming pool, whether in-ground or above-ground is quite expensive especially from the fact that besides the initial costs, there are some necessary accessories that may incur more money. In-ground pools are more expensive than above-ground pools because they are larger, especially in depth and are far much durable than above-ground pools. On average, an in-ground pool should cost you approximately $30,000 for a 12ft. by 24 ft. pool. This is when you add accessories like a retractable cover, private fence, apron, and so on. Remember, this is the price of materials only; labor will push up the cost to $31,500 when you hire a professional whose average charge is $14 an hour, or say, $5.25 for every foot. On the other hand, the average budget for an above-ground pool is $8,300. This is in light of the fact that the average cost for a square foot is $13. So, let’s go with an example of a 19 ft. diameter above-ground foot. The cost will be around $3,700, an extra $620 for a vinyl cover, $130 for a perimeter sidewalk, and $1,350 for a privacy fence brings the total cost to $5,800. When you add labor costs at $9 per square foot, the cost of the pool averages $8,300. The high costs should also get you thinking hard regarding resale value. It is imperative to note that an in-ground will not add value to your property just because it is in a hot area. Remember, not every home buyer is a swimming enthusiast and besides, not all swimming enthusiasts would want an in-ground pool. That said, it is not something you can rely on to push up the value of your home but as an incentive, it’s a great idea. But then, some people might wish for a more portable above-ground pool. An above-ground pool also suffers the same fate and can’t step up your property’s value. But at least, the seller can choose to sell the property and remain with their pool if the buyer is not interested in the pool at all. But above all, there’s one big dynamic; maintenance. The resale value of your pool will be affected by its condition. A well-maintained pool will fetch you more bucks than an old damaged pool with calcium scaling. When thinking along maintenance lines, you need to know that above-ground pools are the best because they require less maintenance. This is compared to in-ground pools that have more complex parts that require proper frequent care. Above-ground pools are also easy to set up compared to in-ground pools which require professionals to construct the pool. Ideally, you should be able to install an average sized above-ground yourself just with the help of an extra man in an hour or so. On the other hand, it would take up to a week to have an in-ground pool constructed. This is because there are more construction demands especially digging. They are also very convenient in terms of portability. If you don’t have a permanent residence, it will be the best purchase because when moving time comes, you just need to disassemble it and assemble it once more elsewhere. For the best swimming pool experience, you must consider proper lighting, heating, and cleaning. When it comes to lighting, you want to set an ambiance around your pool. There are many options to choose from when looking for a swimming pool lighting system. But here, it important to first focus on safety before ambiance. Get a lighting system that will help pool users see things around clearly and more vividly. At times, the weather might be too cold so you wouldn’t want to bear the pain of cold water. Luckily, we have pool heaters that can help increase the temperature of your water. If you live in cold regions, getting a pool heater like Hayward H400FDN will ensure you enjoy your swimming session without necessarily bearing the pain of the cold waters. I know we have learned a lot of things about the best above-ground pools and now it’s time we talk about the critical factors you need to consider when shopping. Remember, there are several factors that make up a good pool. While most people may only look at the cost, it is very important to consider the brand you are buying from. It is always recommended that you buy a renowned brand. This is because top brands offer best in class performance and most importantly, durability. Also, with a popular brand, you are sure of getting replacement parts and also, the aftersales service is excellent. But then, note that such brands will be more expensive but in the long run, they are real value for money. Always remember, you get what you pay for. While cheap brands may prove to be a great deal especially when you are on a budget, they offer average performance and may even last for a few months only. Some of the top brands to consider here include Intex, Bestway, Namco, Backyard Ocean, among others. A lot of homeowners ignore measuring the space they have in their backyard. The worst mistake is going to shop for a pool without knowing the size of space you have for installing the pool. Make sure you know the area of space you have and also consider other factors like trees, sunlight, distance, from home and so on. Here also, it is important to consider what the local and zoning regulations say about the distance from your pool and even the property perimeter. Once all this is set, you can now go out shopping for a pool. 3. What is the size of your family? The next thing you want to ask yourself is, what is the size of your family? If you have a large family, you will definitely need a large pool for those memorable family pool times. Though you are majorly limited by the size of your backyard, there are a few options you have in case you have a small space and you want a big pool. First, consider getting a round pool as it has a larger swimming area. Also, oval pools can save quite some space. But then, a lot of people are not sure what pool size fits different family sizes. What I would tell you is, if you have a large backyard and enough budget, always get a larger pool because there are times you might want to invite friends and family for a swimming session. Also, your family may get bigger and the cost of installing a bigger pool, later on, will be very high. And more so, where will you take the smaller pool? But note that the larger the pool, the higher the price and the harder it is to set up. The process of buying doesn’t end when you receive your order. You might still need to contact the seller regarding several issues. When it comes to aftersales, there are several things you need to consider. The first thing you would want to check is the warranty. Get a pool that has an extended warranty just in case it develops a problem before using it for long. But one important thing here is to ask yourself is, what parts are covered? It is important to read and understand the warranty terms to know what it covers and what it doesn’t. You will realize that most brands offer a warranty on the main unit but the accessories are not covered. The other thing you should be careful about is the genuineness of the warranty. You might buy a pool that has a warranty on book but in the event, you contact the seller, nothing fruitful comes out of it. This means that you either incur the costs of repair or you just buy another pool. But then, how will you know that a warranty is genuine? There is no science to ascertain this but I would recommend you get a top brand. Also, reading customer reviews can give you insights on whether the brand has a genuine warranty or not. Lastly, you must also check the availability of replacement parts. Whether you are buying a resin, semi in ground, round or rectangular pool, there are several parts that will need to be changed often. Make sure these parts are available and the cost is reasonable. I once got a cheap cartridge pool and getting the compatible cartridge was a real headache. I had to order directly from the manufacturer and it took several weeks before my order arrived. Here again, I would advise that you get these popular brands; at least their replacement parts are available locally and at an affordable price. Like earlier said, the durability of your pool will majorly depend on how you maintain it. That explains why the same pool, installed on the same day in different homes will look differently after 6 months of use. But then, there are quite a lot of hindrances that will eventually make maintenance a headache. Here, we are going to discuss some of the ways you can make maintenance an easy and less demanding task. You will agree with me that sodium bicarbonate can be very expensive. But then, it is a must have because it balances the alkalinity of the water without reducing PH. But did you know your kitchen’s baking soda can also do the same job? Baking soda’s main ingredient is sodium bicarbonate so it will still do the job. But one problem would be getting the right proportions but considering the recommended alkalinity is in the range of 80 ppm and 120 ppm, this shouldn’t be a problem after a try or two. The main advantage of baking soda is very much cheaper compared to the branded swimming pool sodium bicarbonate products. One thing most pool owners ignore is testing their water to see the chemical levels. If you suddenly see the water looking murky and irritates the skin and eyes, your water needs testing. Cyanuric acid – This acid will help protect chlorine from the scorching sunlight which will obviously make the chlorine ineffective. Always make sure that the reading for this chemical is in the region of 30 – 50. Calcium hardness – Even though it is common in in-ground pools, there are some above-ground wall pool materials that are affected by calcium. For this reason, you will want to have your pool water at 220 – 350 but on vinyl walls, keep it down. Total alkalinity – This balances the PH levels and brings it to equilibrium. The recommended total alkalinity is 60 – 120. How do you test water? Very few pool owners test their water and probably, you are also wondering, how will you test your water? You may be thinking of it as a technical process but no, it is very simple. You just need to buy a test kit (order several kits) and put inside your pool water’s sample before closing the vials. A few seconds and the color of water starts changing. Compare the color on the comparison charts and adjust the chemicals accordingly, it’s that simple. Properly balanced pool water should be crystal clear, odorless and leaves very little residue on the skin. For many homeowners, only the pool pump and filter need replacement parts; this is very wrong as there are several parts of the pool itself that require servicing and parts replacement. The first part that you should be replacing is the bottom rims. Remember, you don’t want the pool to be exposed to the ground and worse enough, conditions that may foster rusting. From the fact that these parts are made of steel, they may rust and become weaker and thus require frequent checking and replacement as necessary. Remember, these rims hold the walls in place and in case they become weak, the strength of the pool is compromised. Other parts you need to replace include uprights, top ledges, top caps, top & bottom plates, among others. I know your car has a cover, to protect it from the harsh conditions. So do above-ground and even in ground pools want. Besides taking a toll on the body structure of the pool, it prevents evaporation. Remember, when water evaporates, it leaves behind calcium and another residue which will lead to calcium scaling. Every pool owner, at one time or another, will have calcium scales on the walls of the pool and considering it is very hard to remove them once they form, you will want to avoid calcium scaling at all costs. If you see white or white-grey stains on the walls of the pool, that’s calcium scaling. The matter gets complicated as there are two types of scaling; calcium carbonate and calcium silicate. The difference between the two is in appearance and also, formation period. Calcium carbonate is white and flaky and takes a very short time to form. You might leave the pool overnight and in the morning, you find a ring around it. The good thing is that this scaling is easy to remove and will only require pumice stone, scale remover or stain eraser. On the other hand, calcium silicate looks greying and you will hardly notice it developing as it takes quite some time. But then, the damage is almost permanent and will require pumice stone and a lot of hard work. I consider calcium silicate the worst calcium scaling because once it forms, you will scrub the pool wall material to remove it. With this in mind, you can clearly see that calcium scaling is something you need to avoid to keep your pool in good condition. But just how will you keep calcium scaling at bay? Calcium scaling is caused by calcium and PH imbalance; it may be lesser than required or more. The best way to ensure your calcium levels and PH are balanced is to test your water regularly and regulating PH levels. 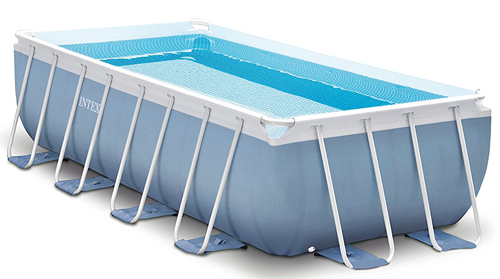 Also, installing an automatic pool cover like Little Giant APCP-1700 would help a great deal. This is because evaporation also leaves calcium deposits in the water and consequently, causes an imbalance. Even though they are on the ground, installation is not as straightforward as placing it on the ground. There are several factors that you need to be very keen on when installing an above-ground pool. Please note that even though most people will tell you installation is a DIY project, it may not be a very easy task. To make sure you install the pool perfectly, here are some key aspects you need to address. The first thing you need to consider is the space that you have for installing the above-ground pool. Remember, in as much as most people say above-ground pools can be installed anywhere, still, space is an issue because you don’t want to be moving it every day. Space is also important because it will help you make the right decision on the size of your pool and most importantly, the shape. I know a lot of people who end up buying very large pools that can’t fit their backyards. For some, they end up using the entire space leaving no room for sidewalks, or even a sunbathe. That said, make sure you but the right pool size. Also, you have to be very conversant with the local regulations and zoning restrictions. Remember, there are several bodies that sanction swimming pool installations and they can be national governing bodies or just local organizations. Just consult to make sure you are adhering to all the regulations, i.e if any. For example, in most places, it is not right to install a pool near the property line. Pools should also be at least 5 feet away from septic tanks and leaching fields. In some states, you will be required to pay an inspection fee even for those small seasonal pools. Remember, while it is illegal to contravene these regulations, it will also be endangering your family if you ignore any of them. That said, you should consider seeking advice on all these regulations. This is why a professional pool installer will come in handy – such firms will do all the paperwork for you so you don’t have to be walking from department to department seeking approval. Even if you are on a tight budget you can still manage to have a swimming without breaking the bank courtesy of above-ground pools. Besides affordability, they are very easy to install and will probably require an hour or two. But then, it is imperative to buy the best above-ground pool and from the 5 picks we reviewed, you must find the perfect match. That said, it’s time to say goodbye and feel free to tell us what you think about these pools in the comments section below. ← How to choose a best swimming pool pump?